This entry was posted in Architecture, Fine Art Photography, History and tagged black & white photography, Colinsburgh, Fife, Scotland, Scottish history. Bookmark the permalink. It is a beautiful building Ruth, it’s what caught my eye in the first place, it was only when I got home that I discovered that it had been in use as a library up until recently! Great photo! My family have been telling me about the scandal with the libraries in Fife. It really is pretty dismal of any council to cut funding and support for libraries. I’ve always been a frequent library user and libraries were absolutely essential to my education. To opt out of supporting libraries is to denigrate education. Good to see you back posting again. I feel like I hadn’t seen a post from you in a while. UNESCO will promote and protect Galloway Library 🙂 Worth to try to call UNESCO. Your photographs are just so beautiful. They have a style and quality to them for sure, but it’s more than that, like you somehow capture the soul of the place. You totally do. I was trying to figure it out, but I couldn’t catch hold of it. Some things can’t be quantified, just appreciated. True. I hadn’t realised how bad the Fife libraries case was – I used to think Scotland was more enlightened than England where 100s of libraries have closed but it’s catching up. Maryhill might even have been demolished. There is a beautiful Carnegie library opposite the Halls which closed for a while last year because the roof leaked and I thought the council might take the chance to find it untenable – but kudos to Glasgow, it’s fixed and open again. That would have been the ultimate ‘kick in the teeth’ if the Glasgow City Council had shut a Carnegie Library,,,,,,,,,,,,,but thankfully not 🙂 Andrew Carnegie must have been one of the worlds great philanthropists (hopefully I spelt that right, and haven’t just said that he liked stamp collecting!!). It’s a shame there aren’t more people like him around today! Haven’t seen you around for much too long, so welcome back! What a lovely building, although I’d love to see the color of the stone. Libraries are my favorite buildings for what’s inside, but if the outside can be this stately, even better. What a shame that the locals can’t use it, but at least it’s still there. You’ve made me SO happy with that 10,000 book figure! I have masses of books but no dedicated room in which to put them, so many are in boxes in the basement and, as you can imagine, not easy to get to. I buy almost all my books at the thrift stores, library sales, or a great chain here called Half Price Books. I’m trying very hard to cut back on what I have, but it’s so difficult. The books seems to stick to my hands when I try to put them in a box to donate. 🙂 As for the library, I rarely have less than 15-20 books from there and as they’re no cost, I have no regrets!! Glad to hear about the community group. I hope that works out. I ended up getting banned (not really banned – just told not to come back with more books) from 4 charity shops in Penzance and St Just! LOL! It was a shame I had to get rid of them all in the space of one week, otherwise I could have spent more time sorting through them (mind you, maybe that wouldn’t have been very good, I would have been like you and got rid of none of them!!). When we moved from Cleveland to the Chicago area, we only had a week to get ready, so although I got rid of many, many things, I simply packed the books and brought them. (The movers were amazed!) I did give away about 15 boxes of homeschool books, but that still left many, many others. Are you a fiction, or non fiction reader? I recently read a good selection of mystery by Mo Hayder, and of course the now local writer, Ian Rankin (The Rebus crime novels). Lovely photo of a magnificent building! I had no idea Scottish councils were decimating libraries as well (knew it was happening in England). It’s one of the most short-sighted and evil acts against the community. But I guess educated people are more likely to question the status quo! I’m so grateful that our council seems to recognise the value of culture and heritage and has actually built a whole bunch of new libraries. Thank goodness for community-based organisations! Though it would be nice if governments stopped taking so much money in taxes since they are shedding so much responsibility. Buy yay for Kirkcaldy Council; that is a really good idea. Hopefully it works out. I’m constantly surprised that our Council — which seems idiotic in many ways — does seem to “get” the importance of culture and heritage. I’m all for affordable housing, but not on the sea front of some of our prettiest villages, Dysart and West Wemyss spring to mind! Aagh! New housing can be such a blight. I’ve watched with increasing distress over the last few years as swathes of coastal land — rich native bird habitats — have been bull-dozed and covered with high-density housing of dubious quality. Ghettos in the making. 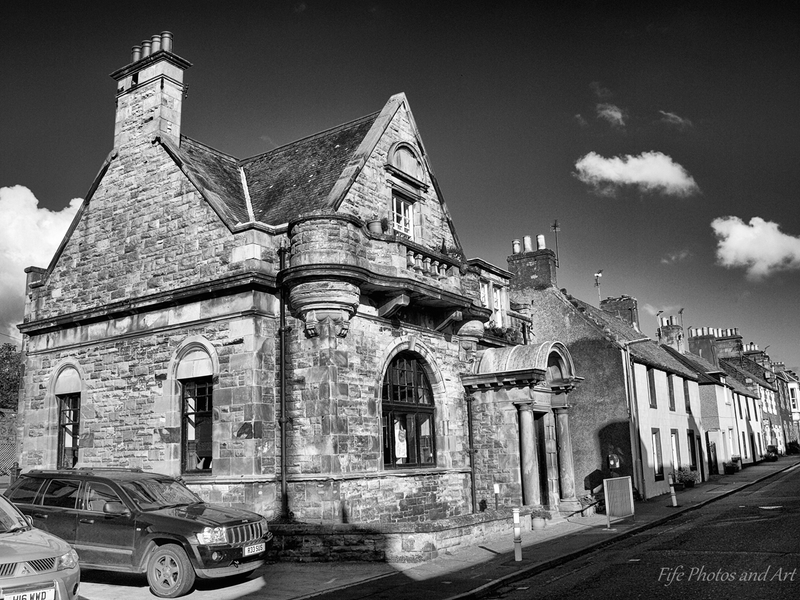 I hate the idea of lovely Fife villages being despoiled. Post-war estates already rendered a lot of countryside and towns quite ugly. I wouldn’t mind an occasional new property going up on the seafronts of some of our villages, if only they would keep them in character with the other older buildings……………what I hate seeing in some modern concrete block of flats placed between two 17th century cottages!! I’m afraid intensive urbanisation and industrial farming are two of my pet hates! We have had too many years being governed by myopic vested interests who haven’t figured out that we can neither breathe nor eat money! It is amazing how many governments and big businesses haven’t yet worked that one out yet Su, there are far more important things in life other than money!!! !